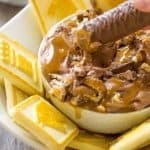 A rich and decadent chocolate fudge dip swirled with caramel and crushed Twix bars makes for a truly amazing dip or dessert! 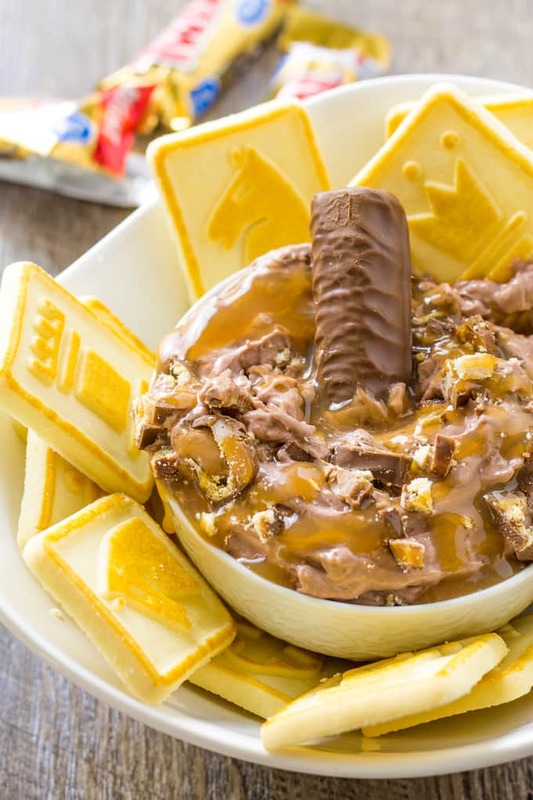 Get ready to make a few batches of this Twix Dip because everyone is going to inhale this! What is a Twix Bar? There is nothing better looking to me than the combination of chocolate, caramel, and buttery shortbread. Well, my family is better looking but I can’t eat them so this is second best. So naturally, I crave Twix candy bars. Just like potato chips, I can’t eat just one so I am always so grateful that there are two bars in that package. 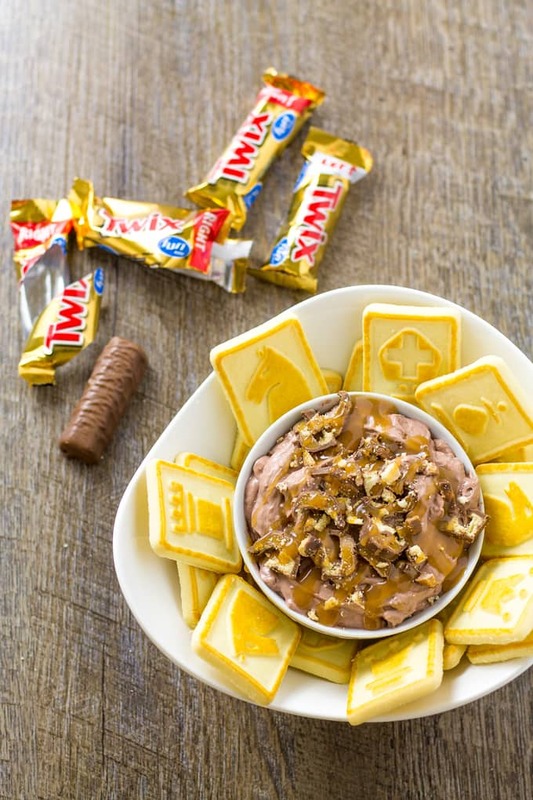 Just take me to the Twix Dessert Dip Recipe Already! 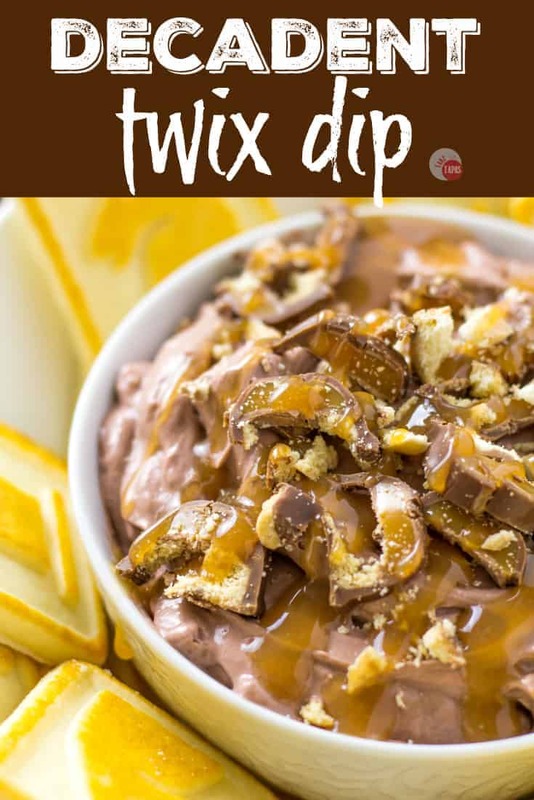 If you’d rather skip my (very helpful, I think) tips and tricks, essential cooking info, and similar recipe ideas – and get straight to this delicious easy Twix Dip recipe – simply scroll to the bottom of the page where you can find the printable recipe card. So what’s Twix Cookies made of? To love a Twix you have to love all the components. All three of them! Three simple ingredients that come together in perfect harmony. If you prefer to call the shortbread cookie a biscuit like the British do, that’s ok as well. I don’t care if you call it “ridiculous crunchy layer” as long as I can eat it!! Because I am a dark chocolate fan, I was very happy when they came out with a dark chocolate version of my beloved candy bar. Do you prefer milk or dark chocolate? Thinking about Twix all day gets me in the mood to eat more than a few bars! It also got me thinking that I might want to make a dip to a party that mimics the Twix bar so I don’t’ have to sneak my mini bars in my pocket and sneak-eat them in the garage while pretending to get more sodas. A Twix only has three ingredients so a dip is pretty easy to throw together! I’m going to start with my typical dessert dip base of cream cheese and powdered sugar. I have used this base in my other dips like my Drunken Cherry Garcia Dip, my Boozy Banana Cream Pie Dip, and my Oatmeal Cream Pie Dip! So now that we have the base, next stop, chocolate! What’s the best way to add chocolate to your dip to mimic the Twix cookies? You can add in straight cocoa powder, or stir in melted chocolate if you want. The only problem with the latter is the cold dip base. Cold cream cheese will cause the melted chocolate to solidify and any residual water in the dip will also cause it to seize up so this is not a good idea! I like to go with another option, which adds creaminess to the dip, and is super easy: chocolate pudding. Chocolate FUDGE pudding to be exact. I haven’t found a box of dark chocolate pudding yet so I usually go with the fudge flavor. A: Yes, you can! Just add the chopped Twix bars on the top just before serving so they don’t get soggy. 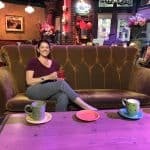 Q: Can I use vanilla pudding? A: Yes, you can. I would miss the chocolate but you can always add chocolate chips or more chopped Twix bars to compensate for it. 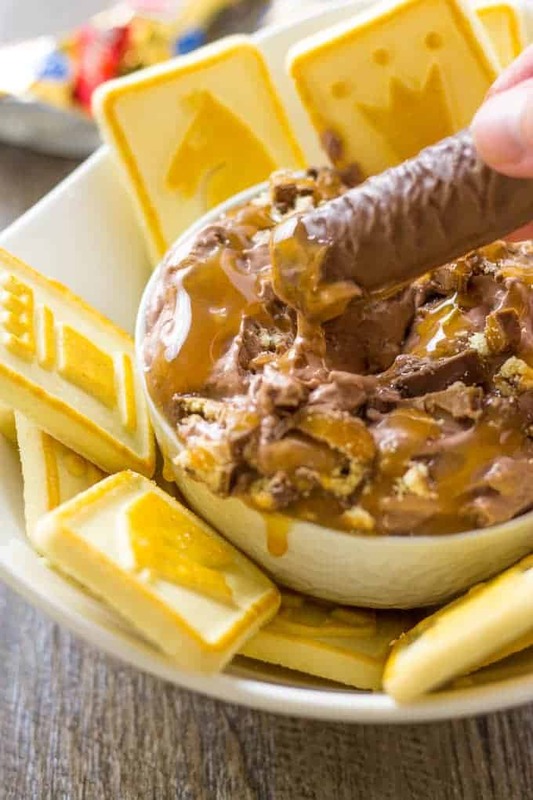 You might be thinking that those few pieces of Twix bars in the dip are not enough shortbread to get the true texture of a Twix in the dip so I use shortbread cookies to inhale, I mean scoop, the Twix dip in my mouth. These shortbread cookies complete the whole picture by adding crunch and that distinct buttery flavor!! Other great Candy Bar recipes to try! 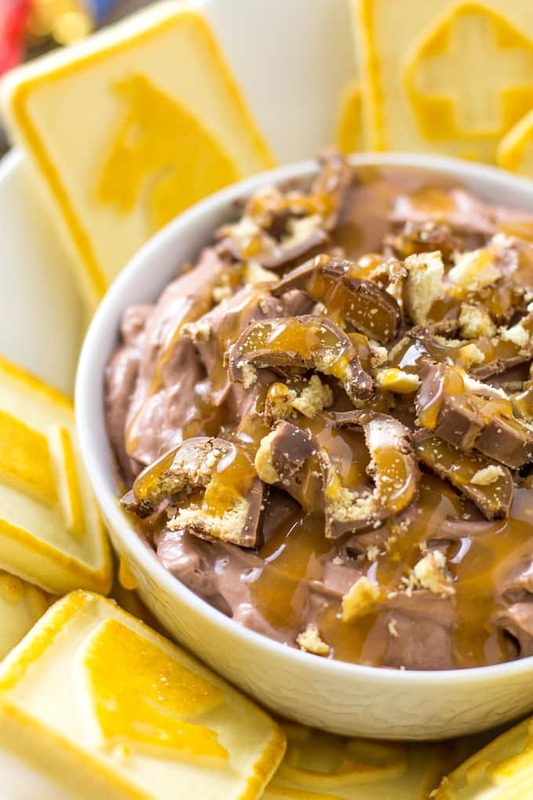 Get your Twix on in a classy way with a bowl of this Twix dip! Decadent chocolate, creamy caramel, and crispy shortbread cookies all wrapped up in one beautiful bowl! 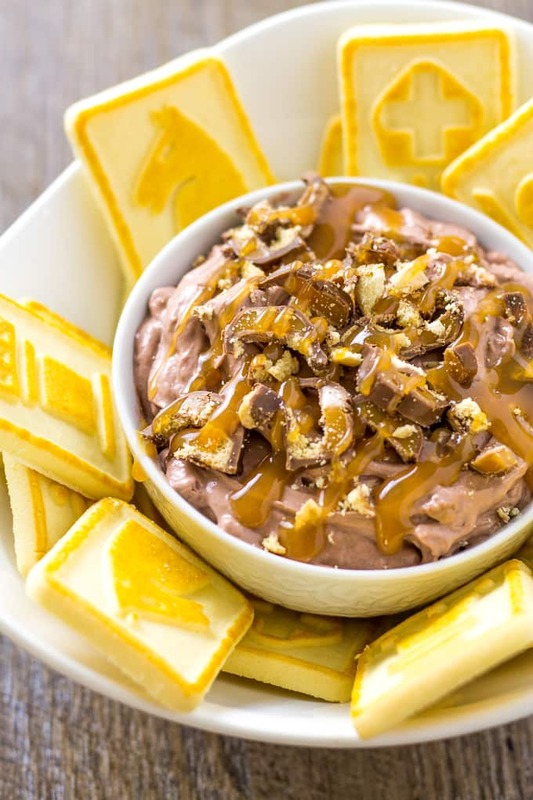 Looking for a sweet dip to take to a party you’ve been invited to? Check out all my sweet dips to fit your special occasion! 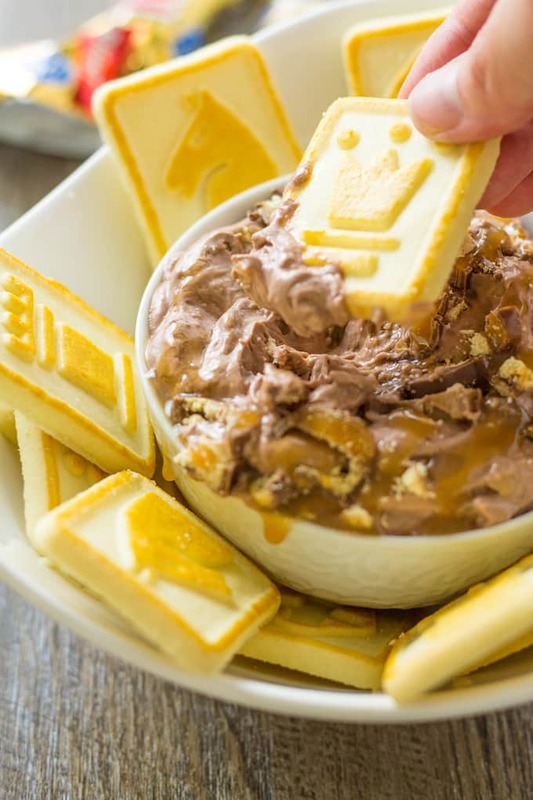 If you love this Simple Twix Dip Recipe as much as I do, please write a five-star review in the comment section below (or on Pinterest with the “tried it” button – you can now add pictures into reviews, too! ), and be sure to help me share on facebook! Prepare the pudding using 1.5 cups of milk instead of 2. Let set up in the fridge for 5 minutes. In a medium-sized bowl, combine cream cheese and powdered sugar. Beat until fluffy and completely combined. Mix slowly until fully incorporated. Chop the Twix bars into small pieces. Add the chopped Twix bars and stir by hand. Add the caramel sauce by drizzling it over the dip and stirring by hand. Chill for at least 10 minutes or until ready to serve. Serve with shortbread cookies for a crunchy dipping experience! Awesome! This is so fun and delicious! I need to figure out how to make it without everyone gobbling it up before ready to serve. Will need to make 2 or 3 at a time.